Remarkable case demonstrates futility of contesting divorce proceedings - The case being VW v BH (Contested Divorce Proceedings). 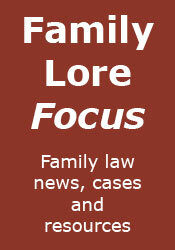 A rare case of a father’s parental responsibility being removed - The case being C v D & Anor. The limits of the court’s power to resolve children disputes - As in RR v MM. Tragic case of litigation pursued beyond reason - The case being AEY v AL (Family Proceedings: Civil Restraint Order).